I urge City Council to amend the Mayor’s proposal to allow only the primary owner, not outside investors, to rent out their homes to guests on a short term vacation rental basis; and to require a minimum three day stay. 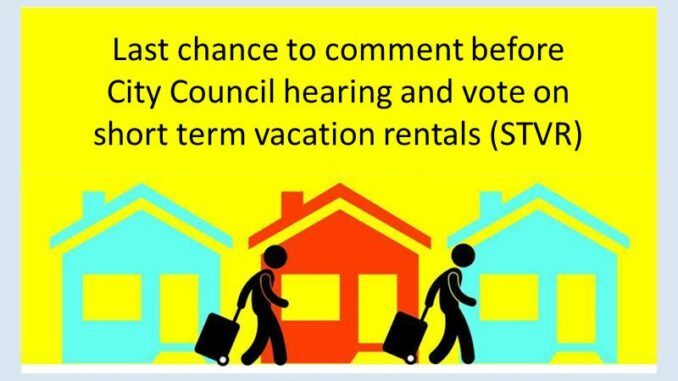 City Council will vote Monday, July 16, on the Mayor’s proposed new ordinance regulating short term vacation rentals (STVR), the Mayor calls STRO. Cities such as Los Angeles, San Francisco, Santa Monica all have passed regulations that protect neighborhoods much, much better than the Mayor’s proposal. The Mayor needs only five votes to pass his proposal; and the vote is expected to be very close. Many neighborhood groups are urging City Council to reject the Mayor’s ordinance or at least amend his proposal to allow only the primary owner, not outside investors, to rent out their homes to guests on a short term vacation rental basis; and to require a minimum three day stay.